A Soft Toy that's 10/10 on the Tuff Scale! Looking for a soft toy for your tough chomping dog? This is a great choice. My dog Pluto loves soft toys! But I don't like what's left of them after 5 minutes! So I was very happy to match her up with a 10/10 Tuff toy and experience some serious play endurance. Does it squeak? Absolutely! It's got 4 squeakers too and they are sewn into safe pockets under 7 layers of material. 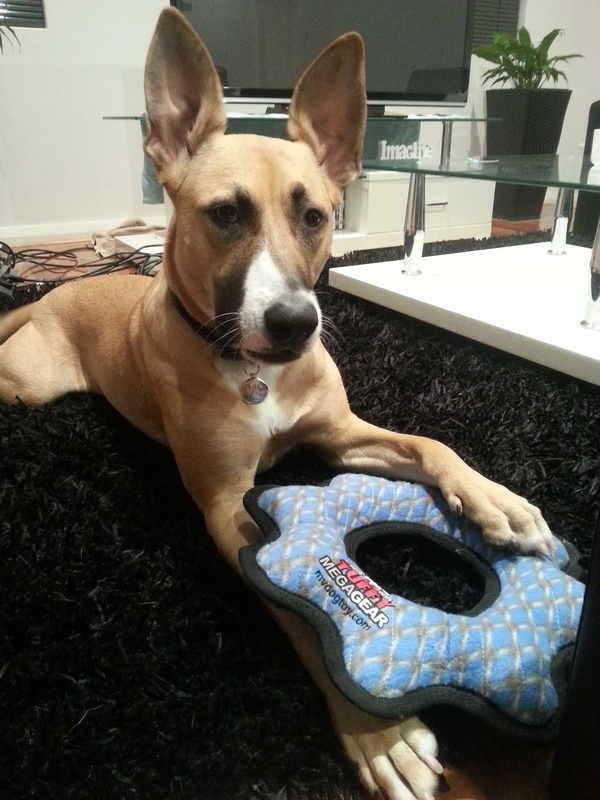 They are quiet squeakers too, so your dog hears them easily but they don't drive you nuts. What's great about the Mega Gear Ring? These Mega Series dog toys have up to Seven Layers of Material: 3 layers of industrial grade luggage material, 3 layers of PVC and finally a layer of soft fleece to make them cosy. The 7 layers of material are sewn together with two rows of linear stitching AND 2 rows of cross stitching. Those 4 rows of stitching are protected with a black trim that are sewn 3 MORE times! Man these toys are serious! 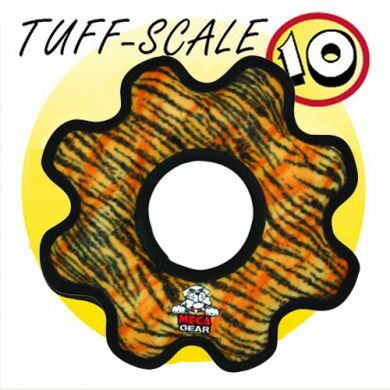 After much researching online, we decided to purchase the Tuffy Toys Mega Gear Ring for our 4-month-old Great Dane puppy, Zeus. We needed something that he wouldn't destroy in a matter of days, and Zeus absolutely loves it! It is part of his daily play-time, and we are happy to say it is still in one piece! Super tough toy, Great buy. Tully loves to destroy toys especially with squeakers. This ones been a great buy - he's had it a couple of weeks and is yet to destroy it. 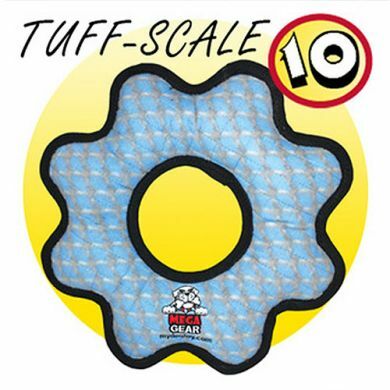 Read 13 customer reviews of Tuffy Toys Mega Gear Ring. The average customer rating is 4.4. Pearl has destroyed everything I have given her over the years...20 minutes was the record for a black Kong!! The tuffy not only lasted Christmas day, it is still kicking on...minus a few squeakies and some foam!! If you have a dog that sounds like this, then this well worth grabbing! Fantastic quality product! We gave it to 2 year old Henry the Labrador early this morning and had a great time playing fetch with it. Came inside to get kids ready to school and within 10 mins the he had chewed through the seems and pulled out a fair bit of the stuffing out. Great toy not Henry proof!! I own a kelpie named sammy and she loves to nibble toys to extract the squeakers I must say this is the first in a long line of so called tuff toys thats held up to the task a month on and virtually no damage. this toy is ok but I have staffys so you can really only use as a fetch toy. my dogs like tug a war but its hard on your hands and is quickly tearing around the edges. 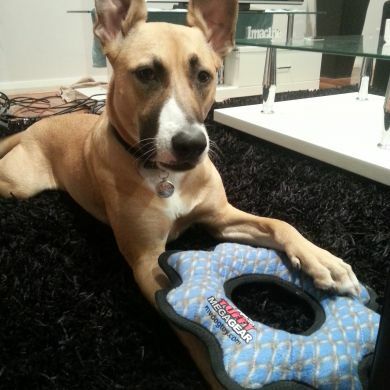 if looking for totally indestructible try west paw toys. Super tuff is the way to describe this toy. Trinity a staffie destroys anything that squeaks. So far so good. So if your after a super tuff toy this is the product for you. Our Saffie (almost 1 year old Labrador retriever) certainly revs up a gear when she sees us with her Tuffy Toy Mega Gear Ring. She loves to play tug and fetch. In fact, play seems to be a higher priority than feeding! We use it tied with an old leash so that we can drag it, have her tug on it or just chase after it. The squeakers are great as they are not too loud for us but loads of fun for her. She is indeed a happy Waggler!